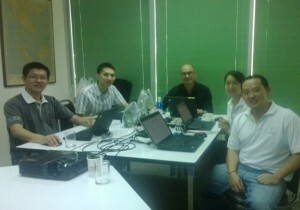 During 22 – 24 May 2013, Ecosoft Co., Ltd welcome 3 NRI’s business consultants from 3 different countries (HK, SGP, CHN) for an Adempiere Training. During training we have discuss on various topics covering both technical and functional of Adempiere. The 3 consultants are experts in other kind of ERPs, but wanted to explore more opportunities for business with Adempiere. It is also good for us to see and discuss Adempiere from the eyes of the experts!